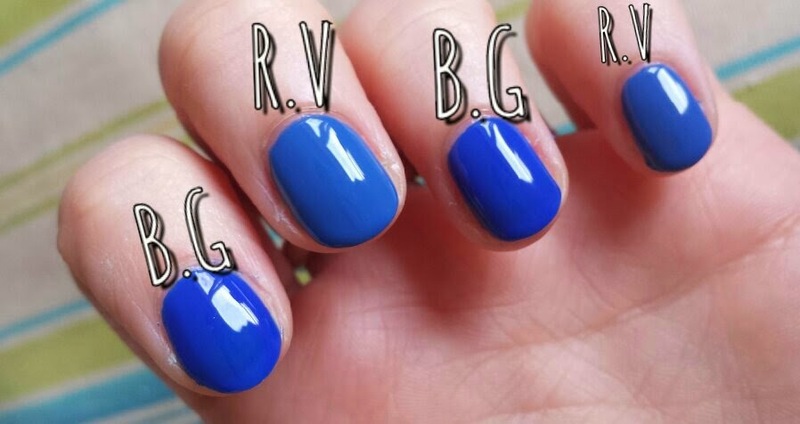 Both Royal Vendetta and Blue Grape are blue shades that are very similar. Blue Grape is more of a cobalt blue where Royal Vendetta has less intensity and is slightly tamer and duller, more of a royal blue. The main issue that I had with applying Royal Vendetta is the brush. I never had any problems with Creme Brûlée, but with this polish I kept finding the brush to be a tad awkward to reach down to the bottom of my nails. Every time I tried to paint from the bottom of my nails (not too close to the cuticles though, we don't want puddles! ), the edges of the brush would fan too far and paint just off the side of my nails. I can’t be certain as to whether or not this was down to the brush or the formula as the brush seems to be the same as the one in Creme Brûlée and the formula applied okay and well otherwise. In fact, I absolutely loved the brush when using Creme Brûlée! Therefore, I can only put it down to the formula being thicker. Or maybe I was having a bad-nail-painting day (don't act like you don't know what I mean! The days where no matter what, your polish just looks a mess)! Anyone else have those? Putting that aside, I found this polish to be a solid two-coater. 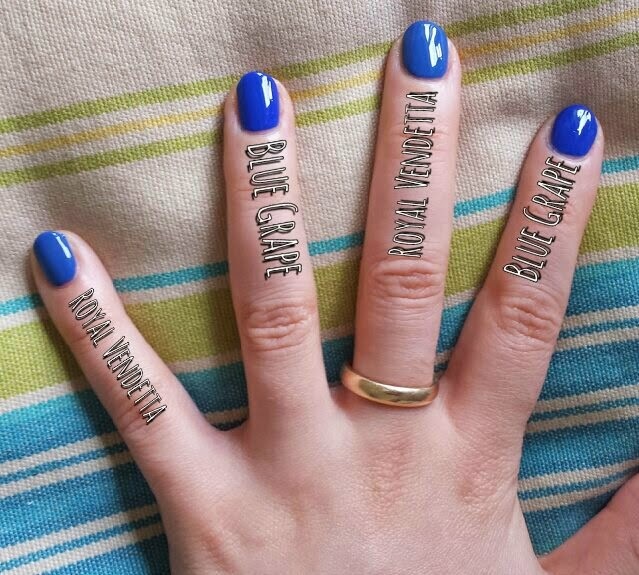 Barry M’s Blue Grape applies a lot thinner than Royal Vendetta but also far less messily. The Barry M brush is easier to use when painting closer to the edges, but as it is thinner it takes slightly longer to coat the nail than the Avon brush. I guess this becomes a lesser of two evils decision - neater, closer to the nail cover with the Barry M brush taking slightly longer or marginally messy, hard to get close to the nail edge but faster Avon brush. However, this is honestly such a minor issue. As you can see, Blue Grape is much sheerer than Royal Vendetta which is a reverse situation to the comparison of Creme Brûlée and Lychee. I would say that for an opaque coverage of Blue Grape you will need three coats, which only adds to the application time against Avon’s Royal Vendetta. When dry, comparing the two of these shades next to each other can make it difficult to tell the difference between them. After one coat they are particularly similar, but after the second coat they begin to differentiate themselves. I think that if Blue Grape had a third coat then the vividness of the shade will stand out more against Royal Vendetta. In regards to the gel-like, high-shine finish, I feel that Royal Vendetta has less of a gel-finish than Creme Brûlée has. It does have a high-shine finish though, but I found that it is also easy to smudge even after more than enough drying time with a top coat. It also attracts little scratches very easily, too. Again, maybe this is down to a fault of my own with potentially too thick a layer of top coat. Maybe I should have skipped the top coat altogether (it is a top coat, too, this polish), but down to having no time I need the dry fast top coat. If Avon released a polish like these Gel Finish ones that included a dry fast top coat within them then I would be a very happy woman. 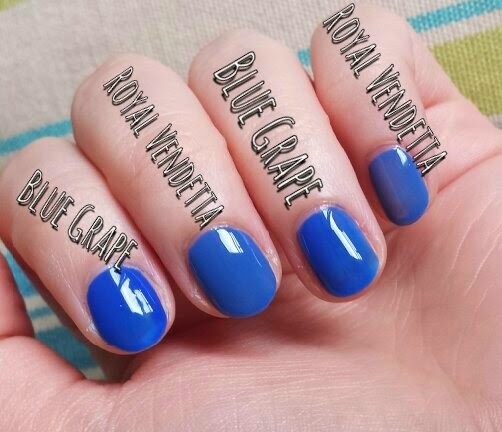 If I have to choose between both Royal Vendetta and Blue Grape I would have a tough time trying to decide. I love both shades separately! Some people may not be able to tell the difference at all, but I find that Royal Vendetta is probably suited better to a relaxed mood whereas Blue Grape is better suited to an energetic mood. It's a subtle difference, but it's enough to affect in that way. In regards to the price, Royal Vendetta is £7 at full price from Avon but is currently still on offer at £3.50 at the time of writing this post. Barry M's Blue grape is £3.99 at Boots and Superdrug. When it comes to Avon Creme Brulee vs Royal Vendetta, I prefer Creme Brulee for the formula and application overall, but I prefer Royal Vendetta for the ability to be opaque in two coats rather than three. 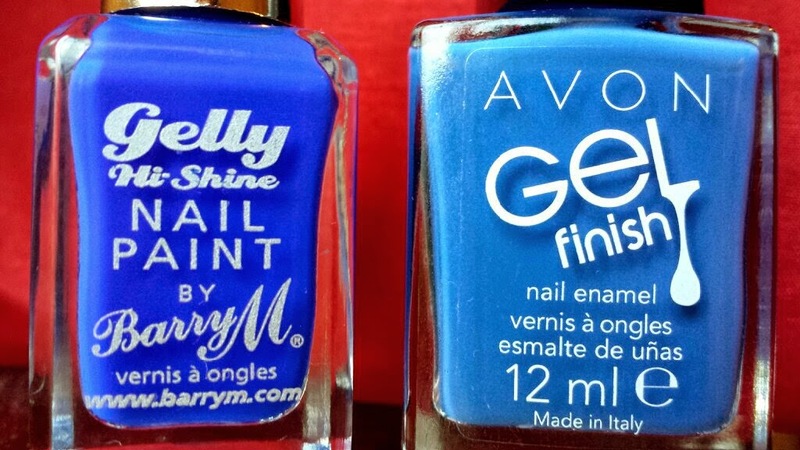 Have you tried either of these polishes? Which do you prefer?